A stele is a standing slab or stone, with hieroglyphic carving or some other kind of sculptured design. 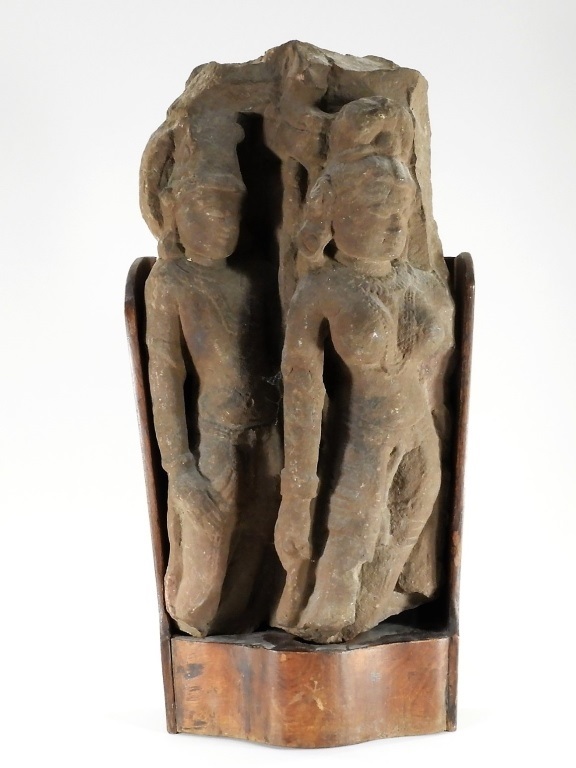 The item pictured here is a 15th century (or earlier) Indian carved stone stele of a standing Vishnu, who is depicted alongside another deity. The 17-inch-tall stele comes with a wood stand and even has the original Leslie Hindman tag in Bruneau & Co. Auctioneers’ upcoming auction slated for Saturday, May 6th, where it’s lot 234 and carries a pre-sale estimate of $600-$900. The auction consists of an outstanding single-owner collection of Asian art pieces. A stele is usually taller than it is wide. It was typically erected in ancient Western culture as a monument. Grave steles were often used for funerary or commemorative purposes. Stelae as slabs of stone would also be used as ancient Greek and Roman government notices or as boundary markers to mark borders or property lines. The surface of the stele usually has text, ornamentation, or both. The ornamentation may be inscribed, carved in relief, or painted. Traditional Western gravestones may technically be considered the modern equivalent of ancient stelae.